This week Advocacy for Animals is pleased to present an article by Dr. Mike Hudak, an environmental advocate who is a leading expert on the harm to wildlife and the environment caused by public-lands ranching. He is the founder and director of Public Lands Without Livestock, a project of the nonprofit International Humanities Center, and the author of Western Turf Wars: The Politics of Public Lands Ranching (2007). Since July 2008 he has been chair of the Sierra Club’s National Grazing Committee. Ranching, environmentally destructive wherever it occurs, is an ongoing tragedy being played out on America’s public lands. Because many of these lands are ill-suited to ranching, damage to the environment is often accompanied by direct or indirect harm to local wildlife. The American people too have been victimized by ranching on public lands—betrayed by government officials who have shirked their legal responsibility to insure that it is environmentally sustainable. What exactly is public-lands ranching? It is quite simply ranching that occurs on public rather than on private lands. In the United States, ranched public lands fall under a variety of jurisdictions, including city, county, state, and federal. But the majority of such lands are managed by ten agencies of the federal government, the most important of which are the United States Forest Service (USFS) and the Bureau of Land Management (BLM). Most ranched federal lands are located in the 11 western states (Arizona, California, Colorado, Idaho, Montana, Nevada, New Mexico, Oregon, Utah, Washington, and Wyoming). Currently, the USFS manages approximately 97 million acres for ranching, while the BLM manages 163 million acres for that purpose. The total number of active grazing permits during fiscal year 2004 on lands managed by these agencies was 23,129. But the number of ranchers grazing livestock on these lands is actually less than this, because some of them hold permits on both USFS and BLM lands and some hold multiple permits under different corporate names. Today’s federal public lands typically entered the public domain because 19th-century ranchers did not regard them as sufficiently valuable to warrant purchase. Such lands may have lacked a water source, possessed poor soil, or been subject to a short growing season due to high elevation. Nevertheless, ranchers who had purchased more productive adjacent lands would graze their livestock on these public lands as well. In fact, several ranchers might simultaneously graze their livestock on a common parcel of public land, leading to the environmental destruction referred to in the title of Garrett Hardin’s article “The Tragedy of the Commons” (1968). Throughout the late 19th century, relentless overgrazing of cattle and domestic sheep extirpated native grasses, leading to soil erosion and the downcutting of streams (the lowering of streambeds by the abrasive action of running water). Consequently, water tables dropped, and many perennial streams flowed only after heavy rains. These degradations to streams, as well as those to uplands, had devastating consequences for much of the wildlife that lived there. Yet, until the establishment of the USFS in 1905, few federal public lands, notably excepting national parks, were subject to governmental oversight. In 1916 Forest Service lands on which grazing occurred became subject to the Organic Act, which required that all federal lands be managed sustainably for “multiple uses.” Today, these uses, broadly speaking, include lumbering, mining and drilling, livestock grazing, and recreation. Grazing on federal lands subsequently continued under a system of “allotments,” in which ranchers paid a minuscule monthly fee to graze each cow and her calf. (The fee was 5 cents in 1906, the equivalent of $1.14 today; in 2008 the fee was $1.35.) The location, intensity, and duration of the grazing were also regulated by a management plan devised by the government. The Taylor Grazing Act of 1934 brought governmental regulation of ranching to many federal lands not incorporated into national forests. These lands are today managed by the BLM. The Federal Land Policy and Management Act (FLPMA) of 1976 required both BLM and USFS lands to be managed sustainably under the multiple-use principle. In theory, governmental management should have restored the environmental health of the lands, allowing wildlife populations to flourish again. In practice, however, the populations of many species, other than game animals (such as deer and elk) and “generalists” (animals that can thrive in a variety of habitats), continued to plummet. With the enactment of the Endangered Species Preservation Act of 1966, the Endangered Species Conservation Act of 1969, and finally the Endangered Species Act (ESA) of 1973, the U.S. government began to conduct serious studies of trends in the populations of nongame wildlife, which revealed that many species were being harmed by ranching on public lands. The ESA also created an administrative framework through which citizens could petition to have a species (flora as well as fauna) listed as threatened or endangered. Overgrazing is not the only way in which ranching harms wildlife. 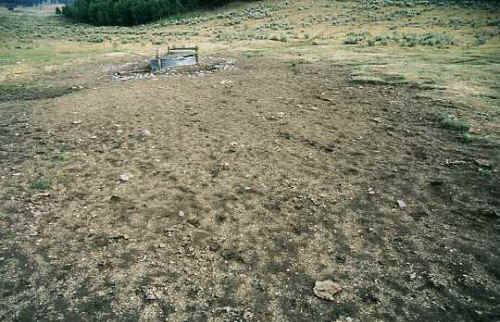 Many practices related to or in support of ranching have also decimated wildlife populations on grazed federal lands. Among these, none has been more obvious than the relentless and widespread hunting of the competitors and predators of livestock. Wolves, grizzly bears, and mountain lions were exterminated long ago in many areas of the American west through the combined efforts of ranchers, farmers, and special government agents charged with “animal damage control” (such agents are now organized in a section of the U.S. Department of Agriculture known as “Wildlife Services”). Prairie dogs, a competitor of livestock, were reduced in population to less than 1 percent of their estimated pre-19th century numbers. Because prairie dogs share dependencies with approximately 200 other wildlife species of the prairie ecosystem, their decimation led to drastic declines in the populations of these other animals. Among them, none has been more adversely affected than the black-footed ferret. Once numbering in the tens of millions, by 1986 the species had dwindled to only 18 free-living individuals. Other aspects of ranching also contribute to the harms suffered by wildlife. Fences thwart the migration of native ungulates (hooved animals), which can lead to death during times of environmental stress, such as droughts and blizzards. Fences also impale birds. Landscapes worn out by decades of overgrazing are often reseeded with nonnative grasses that differ significantly in stature and taste from the native grasses they replace, thus providing no benefit to niche-dependent wildlife. And, prior to reseeding, weeds will have been killed with herbicides, which often poison stream invertebrates and accumulate in the bodies of the fish that consume them. Ranching requires roads, the construction of which kills plants and animals directly. The existence of roads opens up wilderness areas to human activities, such as hunting, wood cutting, and driving off-road vehicles, all of which harm—or have the potential to harm—wildlife. Roads also provide pathways for the spread of weeds, further contributing to the degradation of overgrazed landscapes. How extensive is the carnage that ranching inflicts on wildlife? One reasonable measure is the number of affected species that are either (1) federally listed as threatened or endangered, (2) candidates for federal listing, or (3) the subject of petitions for federal listing. By that criterion, ranching’s victims number 151 species in all: 26 species of mammals, 25 species of birds, 66 species of fish, 14 species of reptiles and amphibians, 15 species of mollusks, and 5 species of insects. In addition, at least 167 other species are harmed by ranching through the degradation of their habitats, though they are not so severely imperiled that they currently warrant federal protection. Mammals. Cattle consume vegetation that provides cover from predators, leading to excessive predation that eventually decimates the populations of prey species. Lack of sufficient prey can then lead to the severe decline of predator species. Overgrazing by cattle can extirpate native vegetation, thus allowing invasion by weeds that are useless as cover and forage for mammalian species. Domestic sheep, which also graze on public lands, can transmit diseases that are lethal to bighorn sheep. Birds. By consuming alder and willow shoots, cattle initiate the destruction of stream-side forests in which many birds nest. Cattle also consume stream-side forbs and grasses, which are home to ground-nesting birds. Long-term cattle grazing can alter the structure of upland forests, replacing widely spaced, large trees with densely packed smaller trees. Dense forests are inhospitable to birds like the Northern goshawk, which requires large trees in which to build nests and open spaces between trees in which to locate and pursue prey. Cattle also harm grassland birds through their consumption of vegetation that birds use as cover from predators and for nesting and forage. Reptiles. Cattle compete with reptiles for forage in vegetation-sparse desert regions. Cattle also spread unhealthy pathogens in their waste. In the case of the desert tortoise, cattle have been known to collapse burrows and destroy eggs. Amphibians. 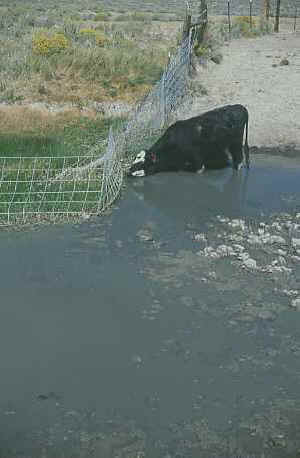 Cattle excrete nitrogen-rich waste into streams. The nitrogen fertilizes algae, the excessive growth of which depletes stream water of oxygen that amphibians require to survive. Fish. Many freshwater fish require clear, cool water. To achieve these conditions in the arid West, a healthy stream is typically sinuous, relatively deep for its width, and often shaded by willows or alders. When cattle consume streamside forbs and grasses, flowing water erodes the banks and straightens the channel. A straight channel allows water to flow more swiftly and erode even more soil. Cattle also consume the shoots of willow and alder, so that when old trees die off there are no replacements, and streams are left unshaded. Major consequences of these changes include silt-laden water that can clog fish gills and smother fish eggs. High water temperatures also mean less dissolved oxygen, thus making fish sluggish. Sufficiently high water temperatures can be lethal to many fish species. Mollusks. To survive in deserts, cattle are provided with water extracted from wells. Water pumping lowers water tables, drying up springs and streams in which mollusks live. Stream flow is also diminished by diversion for irrigating alfalfa, which is fed to cattle during winters. Insects. Vegetation on which insects depend is consumed or trampled by cattle. One can easily understand why these ranching impacts on wildlife occurred prior to the establishment of the USFS’s system of grazing allotments in 1905 and prior to the 1976 enactment of the Federal Land Policy and Management Act, which gave the BLM the same multiple-use, sustained-yield mandate as that of the Forest Service. What is less obvious is why these impacts continue to this day under the management of these agencies. Part of the reason has to do with the structure of the agencies. For example, an agency staff person who makes a decision to reduce or terminate problematic livestock grazing is typically subject to social pressure from ranchers and even from his own relatives and friends. This is because many such employees live in the same communities with ranchers. Their children attend the same schools. They shop at the same stores. They might even belong to the same social clubs. Then there is pressure that a rancher can bring against an agency through his Congressional representative and U.S. senators. Elected officials are typically responsive to complaints of constituents, and when a rancher complains that a decision by a land-management agency may decrease his profits, members of Congress especially pay attention. Since federal land management agencies are funded by annual appropriations from Congress, they are vulnerable to threats of budget reductions. And, of course, those reductions can be very specific, targeted to the district of the affected rancher and perhaps even to a specific staff position within that district. Under a presidential administration having strong rancher sympathies, the situation can be much worse, as persons loyal to the ranching industry will be appointed to high-level positions within land management agencies. They will then impose their will through regulatory changes, not subject to Congressional oversight, that favor ranching, often at the expense of wildlife. The only countervailing force to the ranching industry’s influence over land-management agencies has come from the courts. Lawsuits brought by environmentalists against the federal agencies, typically for not upholding the Endangered Species Act, have been the most effective means of achieving livestock-management practices that do not harm wildlife. Of course, such practices often mean significant reductions in the numbers of grazed cattle, sometimes to zero. Protecting wildlife from the harms of ranching on public lands requires a comprehensive solution that will entail legislation. Legislation that would provide government compensation to ranchers who relinquish their grazing permits has been introduced twice in the U.S. House of Representatives (the Voluntary Grazing Permit Buyout Act in 2003 and the Multiple-Use Conflict Resolution Act in 2005). Neither measure attracted much support. Surprisingly, they received no support from a majority of U.S. national environmental organizations, which purportedly care about the condition of public lands. Thus the harms to wildlife described in this article will likely persist for many years to come. 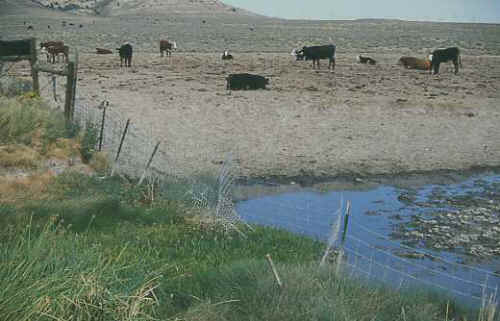 Images: Cattle-free private land abutting the eastern edge of the Granite Mountain Open Allotment, near Jeffrey City, Wyoming; starving cow attempting to reach grass on the ungrazed side of a fence, Granite Mountain Open Allotment; trampled vegetation near water trough, Granite Mountain Open Allotment. All photos courtesy of Mike Hudak.